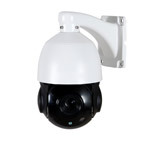 To complement this Zoom the HDT1080PTZ18 also has built in IR night vision allowing you to see up to 50 metre's in complete darkness - so you wont miss a thing day or night!. As you can see from the video footage this camera offers excellent image quality easily allowing you to zoom in and see small objects in detail, like car number plates, at 50 - 60 metres with no problems. You can also see footage of night vision - which is very impressive, lighting up an area which is literally pitch black - the nearest lights as you can see are about 80 - 100 yards away. 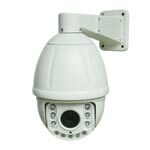 All in all you can see you get good quality footage from a low cost PTZ camera.